Stir with ice and strain into a rocks glass. Garnish with an orange twist. Two Sundays ago, we ventured up to Beverly to eat dinner at the Barrel House American Bar. For a first drink, I asked bartender Sean Maher for something I had spotted on the restaurant's Instagram that they did for a Whistle Pig-sponsored dinner. Sean explained how that drink, the Killing Floor, was originally created for a guest a few weeks before, and it turned out to work perfectly for the event. Once prepared, the Killing Floor presented an orange and rye aroma with dark notes in the mix. Next, a caramel and grape sip then led into a rye and bitter orange swallow with a quinine-tinged finish. 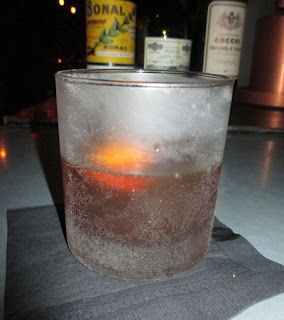 Overall, the cocktail was like a darker and more bitter Brooklyn albeit without the Maraschino notes. Is the Cocchi Vermouth very distinct in its flavor or do you think one could substitute it with Carpano Antica ? Carpano is bit richer, though with a similar profile. Probably would work fine. Do you think Contratto is closer to Cocchi than Carpano is ?